Grégor Miguel Blanco attended Ignacio Burk (VZ) High School...Brother Grégory played two minor league seasons with the Angels (2003) and Pirates (2004)...Attended Ignacio Burk High School in Caracas, Venezuela...Is Married (Zulay)…Has one son, Grégor Jr. (August 11, 2010) and one daughter, Grecia (Grace) Del Valle (October 15, 2015). Made the Giants' Opening Day roster and played in 42 games, making 25 starts, before being designated for assignment on June 2...Cleared waivers and signed a minor league contract with the Giants on June 8...Had his contract purchased from Triple-A on August 29...Spent the rest of the season with San Francisco...Hit two leadoff homers (May 10 at Philadelphia and September 9 at Milwaukee)...Appeared in 68 total games for the Giants, making 40 starts (18 in left field, 16 in center field and six in right field)... Batted .247 (42-170) with seven doubles, two triples, four homers and 13 RBI in 60 games for Sacramento (AAA). Was a non-roster invitee to Diamondbacks Major League spring training... was selected from triple-A Reno on May 5...Made 43 appearances in left field (18 starts), 35 in center (32) and six in right (two) with Arizona...Was successful in 15-of-16 stolen base attempts...Hit his fifth career leadoff home run on May 25 at Milwaukee...Matched his career-high with three stolen bases on Oct. 1 vs. Kansas City (fourth time). Made 56 starts for San Francisco and hit .235 in his starts...Went 7-for-33 (.212) as a pinch-hitter...Missed 22 games with a right shoulder impingement (Aug. 23-Sept. 16)...Hit his first career pinch-hit home run on July 8 vs. Arizona, hitting a solo shot off RHP Silvino Bracho in the 8th inning. Batted a career-best .291 in 115 games with the Giants, his fourth-consecutive season with the team....Started 78 games (34 in CF, 25 in LF and 19 in RF).... Landed on the seven-day concussion disabled list June 10 (retroactive to June 9), three days after Brandon Belt accidentally hit him on the head with a between-inning practice throw while the team was in Philadelphia...Blanco was hit midway through the game of June 7, but said he continued to play because his symptoms were not bad...was removed from the DL June 19... Was diagnosed with a concussion for the second time during the season, this time as the result - most likely - of a shot he took from an infielder's knee while sliding into second base in Los Angeles in September...missed the Giants' final 22 games. Finished his third season with the Giants and batted .260 (102-for-393) with 51 runs scored, 18 doubles, six triples, five home runs and 38 RBI in 146 games...went 16-for-21 in stolen base attempts, with his 16 steals tying Angel Pagan for the most on the team...Started 92 of 162 games, making 56 starts in center field and 36 in left...committed just one error in 226 total chances (six assists)...Went 7-for-25 (.280) with five RBI as pinch-hitter...Batted just .213 (30-for-141) in the leadoff slot with 12 extra base hits and 12 RBI, however hit .333 (84-for-252) everywhere else. Made his second-straight Opening Day roster with the Giants and batted .265 (120-for-452) with 17 doubles, three HRs and 41 RBI in 141 games. Made 113 starts (63 in center field and 50 in left field). Was 8-for-19 (.421) with three extra base hits as a pinchhitter. Led the club with six triples and ranked second with 14 stolen bases. Drove in a career-high four RBI on May 11 vs. Atlanta... came off the bench and hit a pinch-hit three-run double in the 5th inning and then drove in another run with a triple in the 8th in SF's 10-1 win. Hit his first career leadoff home run on June 14 at Atlanta, homering off RHP Kris Medlen. Hit .373 (22-for-59) in 23 games during the month of Sept., by far his best month. In his fourth big league season Blanco batted .244 (96-for-393) with 14 doubles, five triples, five home runs and 34 RBIs in 141 games in his first season with San Francisco...Made 90 starts (50 in right field, 25 in left field, 14 in center and one as the designated hitter)...Since Melky Cabrera was suspended on Aug. 15, his playing time increased, starting 23 of SF's final 45 games...Stole a career-best 26 bases (26-for-32), the second-most on the team...His six bunt hits ranked as the ninth-most in the NL...Hit his first home run of the season on May 14, hitting a solo shot off Rockies' LHP Christian Friedrich that tied the game at 1-1 in the 6th inning...marked just his third career home run and his first since Aug. 21, 2010 (a span of 172 at-bats...Preserved Matt Cain's perfect game on June 13 vs. Houston with a spectacular catch in deep right center fieldduring the 7th inning ...was playing the gap in right field as Jordan Schafer hit a deep drive to the wall...Blanco covered an enormous amount of ground to make a diving leap to secure Cain's perfect bid...POSTSEASON HIGHLIGHTS...On his first career postseason roster, Blanco startedall 16 games in left field and hit .235 (12-for-51)...Hit a two-run home run off of the Reds' Mike Leake in Game 4 of the Division Series on Oct. 10, breaking a 1-1 tie. Spent campaign with triple-A Omaha and Syracuse in Royals and Nationals organizations, combiningto hit .201 (40-for-199) in 74 games...Following season he played in Venezualen Winter Leagueand was named MVP of league after leading all players in on-base pct. (.478), stolen bases (18) and runs scored (47), while finishing 4th with .337 avg. (66-for-96). Gregor was acquired from the Braves on July 31 with relief pitcher Jesse Chavez and minor league left-handed hurler Tim Collins in exchange for outfielder Rick Ankiel, pitcher Kyle Farnsworth and cash...Hit .315 (57-for-181) with 14 extra-base hits against right-handers but just .179 (10-for-56) with no extra-base hitsvs. lefties...Missed the August 10 and 11 games for the birth of his son, Gregor Jr., on August 11 in Atlanta. Played for his native Venezuela in the WBC, hitting .400 (6-for-15, 1 2B, 2 3B, 2 RBI) in six games...Began the season with Gwinnett (AAA) and hit .228 with two home runs and 30 RBI in 90 games...Was recalled to Atlanta on 6/2, appeared in 24 games and hit safely in five of 17 games with an at-bat...Had a career-high three-hit game on 6/30 vs. PHI...Hit safely in 52-of-86 games with an at-bat for Gwinnett, including 18 multi-hit games...Became the first Gwinnett Brave to record five hits in a game on 8/31 at DUR. Participated in the 2009 World Baseball Classic as a member of his native country, Venezuela....Ranked second among National League rookies with a .366 OBP...Finished 2nd among NL rookies in OF assists with seven. He had a career-high two in LF on 8/15 vs. SF...Rookie outfielder made 113 starts (55 in LF, 54 in CF, 4 in RF)....Led the team with 13 stolen bases....Had a team-leading 26 infield hits (7th in NL) and 15 bunt hits (2nd in NL)....Got off to a fast start, hitting .371 (13-for-35) in April....Hit .293 (29-for-99) with runners in scoring position....Matched career high w/ four hits 7/29 vs. STL. He also set a career high with three RBI 7/23 at FLA....Hit safely in 20 of his last 29 games (37-for-121, .306) since 6/25....Snapped his career-high seven-game hitting streak (14-for-29, .483) on 7/4 vs. HOU....Had career-high four hits on 6/28 & had five straight multi-hit games 6/25-7/1....Clubbed first career homer off Dave Bush in the second inning 5/27 at MIL....Had PH double in the 9th inning on 4/9 at COL off M. Herges for first MLB hit....Made MLB debut as a PR in the ninth inning 3/30 at WSH and scored the tying run on a passed ball....Grounded out in the 7th inning on 3/31 vs. PIT in his first MLB at-bat. Led International League with 81 runs scored in his 1st full season with triple-A Richmond...Was Richmond Player of Month for May, hitting .283 (32-for-113) with 6 2Bs, 10 RBI and 7 stolen bases...Had 9-game hitting streak from May 17-26, batting .350 (14-for-40)...Hit .294 with home run and 2 RBI in postseason for Richmond...Played winter ball with Tiburones de La Guaira, hitting.345 (79-for-229) with 4 HRs and 18 RBI. Began the year at Mississippi (AA) before being promoted to Richmond (AAA) on 6/18...Was named Mississippi Player of the Month for April (.259, 19 R, 3 RBI, 14 BB, 9 SB)...Led Mississippi with 17 stolen bases and ranked fourth in the organization with 31 combined steals...Led all Braves minor leaguers with 88 runs and 151 hits and was third with 28 doubles...Had a season-high four hits on 4/10 vs. HVL with two doubles...Stole a M-Braves team-high three bases to go with three walks on 4/25 vs. MTG...Had a M-Braves team-high 12-game hitting streak from 4/29-5/12 (.367, 19-for-52)...Was 0-for-3 in five Grapefruit League games in the spring...Hit a combined .321 (114-for-355) with 22 doubles and 22 RBI vs. RHP and just .224 (37-for-165) vs. LHP...Played in the Venezuelan Winter League for the Tiburones (.313-1-10 in 54 games). Led Braves minor leaguers and the Southern League with 12 triples and ranked fifth and eighthrespectively with 28 stolen bases...Ranked ninth among Braves minor leaguers with 64 runs scored and ranked seventh in the Carolina League with 73 walks...Had a nine-game hitting streak (.424, 14-for-33) 5/12-22...Reached base safely via hit or walk in 22 consecutive games 5/4-29...Was the first batter, hit the first tripleand scored the first run in Mississippi Braves history on 4/7 at Mississippi Trustmark Park...Played in theVenezuelan Winter League for the Tiburones (.313-1-10 in 54 games). Tied for fifth in the organization and second for the Myrtle Beach Pelicans in stolen bases with 25...Led the Pelicans and ranked second among Braves minor leaguers with nine triples...Had an 11-game hitting streak (5/18-6/3)...Stole two bases and scored twice leading the Pelicans to a 6-1 win on 5/29...Had a perfectnight at the plate on 6/10 going 3-for-3 with a double and a home run...Recorded a 13-game hitting streak(6/26-7/11), third highest in the Carolina League during the 2004 season...Batted .333 with two home runs duringthe streak...Batted .290 (27-for-93 in August, 12 of his 27 hits were extra-base hits, including four triples. Led the Myrtle Beach Pelicans with 34 stolen bases...Ended the season on a high note, batting .302 in August (26 games). Led the Macon Braves with 40 stolen bases...Stole four bases, went 2-for-3 at the plate and scoredtwo runs on 5/8. Began his professional career with the Dominican Summer League Braves and hit .330. December 21, 2018 New York Mets signed free agent CF Gregor Blanco to a minor league contract and invited him to spring training. 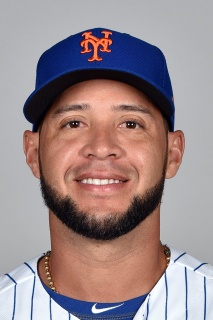 December 21, 2018 CF Gregor Blanco assigned to Syracuse Mets. December 11, 2018 Tiburones de La Guaira signed free agent CF Gregor Blanco. October 29, 2018 CF Gregor Blanco elected free agency. August 29, 2018 San Francisco Giants selected the contract of CF Gregor Blanco from Sacramento River Cats. June 8, 2018 San Francisco Giants signed free agent CF Gregor Blanco to a minor league contract. June 8, 2018 Sacramento River Cats released CF Gregor Blanco. June 8, 2018 CF Gregor Blanco assigned to Sacramento River Cats. June 5, 2018 San Francisco Giants sent CF Gregor Blanco outright to Sacramento River Cats. June 2, 2018 San Francisco Giants designated CF Gregor Blanco for assignment. March 29, 2018 San Francisco Giants selected the contract of CF Gregor Blanco from Richmond Flying Squirrels. March 23, 2018 LF Gregor Blanco assigned to Richmond Flying Squirrels from Sacramento River Cats. February 6, 2018 San Francisco Giants invited non-roster LF Gregor Blanco to spring training. February 6, 2018 LF Gregor Blanco assigned to Sacramento River Cats. November 2, 2017 LF Gregor Blanco elected free agency. May 5, 2017 Arizona Diamondbacks selected the contract of LF Gregor Blanco from Reno Aces. May 4, 2017 OF Gregor Blanco assigned to Reno Aces from Visalia Rawhide. April 27, 2017 OF Gregor Blanco assigned to Visalia Rawhide from Reno Aces. April 27, 2017 OF Gregor Blanco roster status changed by Reno Aces. April 6, 2017 Reno Aces placed OF Gregor Blanco on the 7-day disabled list. January 24, 2017 OF Gregor Blanco assigned to Reno Aces. January 18, 2017 Arizona Diamondbacks signed free agent RF Gregor Blanco to a minor league contract and invited him to spring training. November 3, 2016 RF Gregor Blanco elected free agency. September 16, 2016 San Francisco Giants activated RF Gregor Blanco from the 15-day disabled list. August 23, 2016 San Francisco Giants placed RF Gregor Blanco on the 15-day disabled list retroactive to August 22, 2016. Right shoulder impingement. June 19, 2015 San Francisco Giants activated LF Gregor Blanco from the 7-day disabled list. June 10, 2015 San Francisco Giants placed RF Gregor Blanco on the 7-day disabled list retroactive to June 8, 2015. Concussion. December 4, 2012 CF Gregor Blanco assigned to Tiburones de La Guaira. April 4, 2012 San Francisco Giants selected the contract of Gregor Blanco from Fresno Grizzlies. January 18, 2012 San Francisco Giants signed free agent LF Gregor Blanco to a minor league contract and invited him to spring training. January 18, 2012 Gregor Blanco assigned to Fresno Grizzlies. November 2, 2011 LF Gregor Blanco elected free agency. October 12, 2011 LF Gregor Blanco assigned to Tiburones de La Guaira. September 6, 2011 Syracuse Chiefs activated LF Gregor Blanco from the 7-day disabled list. July 25, 2011 Syracuse Chiefs placed LF Gregor Blanco on the 7-day disabled list. May 11, 2011 Syracuse Chiefs activated LF Gregor Blanco. May 8, 2011 Omaha Storm Chasers traded LF Gregor Blanco to Syracuse Chiefs. March 30, 2011 Kansas City Royals sent Gregor Blanco outright to Omaha Storm Chasers. December 31, 2010 CF Gregor Blanco transferred to Leones del Caracas from Tiburones de La Guaira. October 8, 2010 Gregor Blanco roster status changed by Tiburones de La Guaira. July 31, 2010 Atlanta Braves recalled Gregor Blanco from Gwinnett Braves. July 21, 2010 Atlanta Braves optioned Gregor Blanco to Gwinnett Braves. May 25, 2010 Atlanta Braves recalled Gregor Blanco from Gwinnett Braves. March 28, 2010 Atlanta Braves optioned Gregor Blanco to Gwinnett Braves. January 20, 2010 CF Gregor Blanco transferred to Leones del Caracas from Tiburones de La Guaira. October 19, 2009 Gregor Blanco roster status changed by Atlanta Braves. October 8, 2009 Gregor Blanco assigned to Tiburones de La Guaira. July 12, 2009 Atlanta Braves optioned Gregor Blanco to Gwinnett Braves. June 2, 2009 Atlanta Braves recalled Gregor Blanco from Gwinnett Braves. July 4, 2000 Atlanta Braves signed free agent OF Gregor Blanco to a minor league contract.